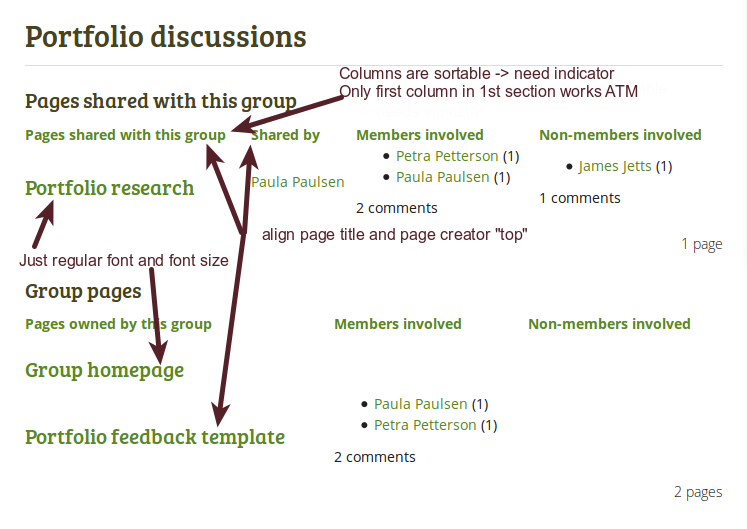 When converting to Bootstrap, we knew there was some more work needed for the participation report in a group. If you don't see it, you can activate it on a group's settings page and would then need a few pages shared with the group, created in a the group and have some comments on them. 1. Add the indicator for which column is currently the one that is sorted. We already have that in Administration -> Users -> User search. 2. All columns should be sortable, but it doesn't work properly for me. I could only get the first column under "Pages shared with this group" to sort and that sorted also "Pages owned by this group". 3. The page in questions should just be displayed in regular font and font size instead of a heading. This is a report only. 4. The cells for page titles, owners and people who commented should be top-aligned within their row. 5. It would be good to have lines between the individual rows as we have in other tables. sorted also "Pages owned by this group"." Adding a partial fix for point 2 "All columns should be sortable" - now all columns can be sorted. The sorting still effects both tables of data but that is ok I recon. If not then a patch to fix that will need the sort to be labelled differently for the 2nd table and have the links keep note of both table's sort settings. I think it's OK to keep the sorting of both tables at the same time for the time being.